Recently I’ve tackled a couple of books that have helped me pull back the curtain, so to speak, on the business of filmmaking. I’m not talking about the accounting tricks that Hollywood uses to hide the profits from hit films, although those numbers are part of the story. What I’m talking about is the almost-alchemical wisdom, the mystical structures that underlie not only filmmaking but all kinds of real-world systems, from chemical reactions in the cells of the human body, to the world wide web, to that hot topic, social networks. Before any non-technical folks get worried about any deep math being thrown at them, let me just say that this article is not going to, nor am I qualified to, submerge anyone in numbers and graphs. I got as far as AP Calculus in high school, and one of the reasons I chose to study at NYU was the lack of any math requirements in the core curriculum. My avoidance of the topic is regrettable, because I’ve recently discovered the math as it applies to real-world examples from the film business is both intuitive and illuminating. I’d like to share a little of what I’ve been reading about and see if I can extrapolate from it some tips and tricks for turning these hidden forces to the filmmaker’s advantage. The first book on the syllabus is Linked: How Everything Is Connected to Everything Else and What It Means by Hungarian mathematician Albert-Lásló Barabási. It was loaned to me by a friend who designs the complex networks behind television studios. Barabási describes how he and several colleagues built on existing theoreticial work by two legendary mathematicians of an earlier generation, Paul Erd?s and Alfréd Rényi (who called mathematicians a “machine for turning coffee into theorems”). Erd?s and Rényi had done a great job of defining how to analyze networks – any system comprised of links and nodes. But Barabási and others saw that the networks they made and ran computations on were artificially created, using a sort of random method where any node had an equal chance of being connected to any other. Real networks ain’t like that! Analyzing real data on the structure of the internet, on chemical reactions in cells and — no joke — the connections between actors in movies which underpins the ‘Six Degrees of Kevin Bacon Game’, Barábasi and others discovered that real world networks, even in such wildly different domains, all share similar properties. As Linked points out, when you run the math on the IMDb listings, it turns out that Kevin Bacon isn’t even close to the most central actor in Hollywood. At the time the numbers were crunched for Linked, Rod Steiger was the most central actor in Hollywood. As of the time of this writing, a website called The Oracle of Bacon, which tracks this sort of thing, lists the top three as Dennis Hopper, Harvey Keitel and Donal Sutherland (who coincidentally starred in the Six Degrees of Separation movie); Kevin Bacon is all the way down at #507. As you can see from the list, an actor gets to be more central by having both a long career and a varied one. Linked points out that actors that play in all different genres help to connect themselves to far-ranging parts of the network, doing better than if they spent a long career doing Westerns with other actors who also only did Westerns. This may all seem like an idle bit of fun, but I believe it may have relevance to the independent filmmaker. I dare say that an actor’s centrality ought to be taken into consideration with other more obvious factors during casting. An actor with a high centrality to the Hollywood network is likely to be versatile, easy to work with (or they wouldn’t have gotten hired so much) and, most importantly, if they are cast early on, can help net other great actors simply because they are more likely to know them, or know someone who does. 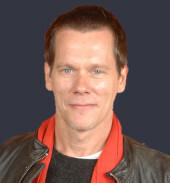 Of course, ‘Six Degrees of Kevin Bacon’ is just a small story in the larger book of Linked. But I think there are some wider points to draw from Barabási’s book in two main areas: 1) movie marketing should be designed to take advantage of the natural structure of social networks, and 2) the slate of movies a movie studio develops should be robust. On the first point, while it’s impossible with current technology to map all the connections between everyone in the entire world (facebook’s database perhaps comes closest), Barabási and his colleagues have shown it is quite possible to map a subset of such a network. And, because of a property of natural networks — they are “scale free,” meaning, like fractals, the structure of the smallest parts follows the structure of the largest parts just as the veins in a leaf look like the branches in a tree — we can extrapolate from the subset of the network the structure of the whole. In any case, if you want your trailer to “go viral,” it is critical that, like the spread of the HIV/AIDS virus as explored in Linked, you put your efforts into ‘infecting’ carriers that will spread it to the maximum number of people, the Dennis Hoppers and Harvey Keitels of whatever demographic you are trying to reach. Thanks to sites like facebook, there is a marketing revolution afoot which will let you ‘microtarget’ these ‘superconnectors’. My advice to indie filmmakers is to be sure collect data about your fans, because that data gets more and more useful as this technology grows. A power law distribution, with the long tail in yellow. The area of the yellow portion is equal to the green portion, demonstrating that a small portion of the nodes have 50% of the links. The later chapters of Linked talk about why natural networks tend to form in the ways they do, with a “powerlaw” distribution of a few, super-connected nodes with many links and “long tail” of less-connected nodes. Obviously, this is less efficient a network design than having every node linked to one big central node. But this configuration is very robust to disruption. Barabási’s experiments showed that you could remove nodes at random for a long time with very little effect to the overall structure of the network. It turns out this matches the distribution of movie studios, with a few major studios and lots of small ones. And, because it is scale-free, this distribution is also similar to the slate of movies from a big studio: lots of small movies and a few monster hits, which make most of the profits. So it turns out that the big studios are not big because of anything special, just the most robust due to natural evolution. Just like an ecosystem where big fish eat the little ones, the major studios survive by having their various specialty arms robustify the core business of the summer blockbusters. 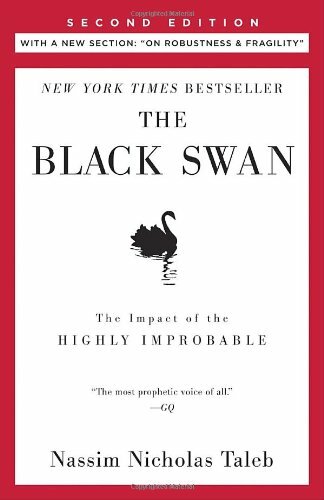 The Black Swan: The Impact of the Highly Improbable by Nassim Nicholas Taleb is a more entertaining book to read than Linked, but also more dense. Before I get into Taleb’s tangled web of ideas, I have to say that it is fortuitous coincidence that the book has just, earlier this month, come out in a second edition here in the US with a long essay appended to the end entitled “On Robustness and Fragility,” just the topic which Linked had begun to explore. And it is no coincidence that Taleb is familiar with Barabási’s research; in The Black Swan, he mentions this research along with the work of hundreds of other mathematicians, physicists, economists, psychologists, philosophers and writers of fiction. Taleb is one of those rare synthesizing thinkers who can slip effortlessly between disciplines and still emerge as an original and undiluted intellect. I found him often abrasive — he is particularly harsh towards his critics — but always provocative. Taleb has readily admitted in interviews that he has only one idea, which all his books are about, including The Black Swan. This is the idea of what he calls “convexity” — it is a simple idea (he says) about being more exposed to positive unpredictable events and less exposed to negative unpredictable events. This is actually the former options-trader Taleb’s investment strategy. He’s one of the few people out there who predicted the market meltdown of 2008 and was correctly positioned for it. Filmmakers will be happy to learn that he is bullish on the movie business, which, along with pharmaceuticals, he sees as businesses with a huge potential upside (an amazing new drug, an Avatar-sized hit movie) for a known risk (losing all your money). And that’s what the idea of the “black swan” is, if I can boil it down. A black swan is an unforeseen event which dramatically changes the picture. The name comes from the notion that the Western world thought swans were always white… until black swans were found in Australia. Taleb uses, as one example, a graph of the weight of a turkey. For years it rises steadily — if it was a stock you’d feel pretty good. Then one Thanksgiving… BOOM! The turkey is eaten. To us humans, the turkey’s death is not a black swan. We can predict it. But to the turkey, he thought he was in a good position right until an unforeseen axe came down. Taleb has all kinds of ideas around the “black swan”: upcoming major events we can take into account are gray swans. We may not know when a massive earthquake will hit Los Angeles, but we can be reasonably sure that one will happen eventually, and so we can prepare for it. And black swans can be positive or negative. Luckily for filmmakers, Taleb views the film business as a “convex” to black swans. While ‘a movie not performing up to expectations’ is a negative black swan, the hit films that regularly come out of nowhere are positive black swans, and seem to more than cancel out the negative. Taleb cites multiple times the work of Hollywood economist Arthur De Vany in The Black Swan, because De Vany has been an explorer in one of Taleb’s favorite territories: the land of Uncertainty. 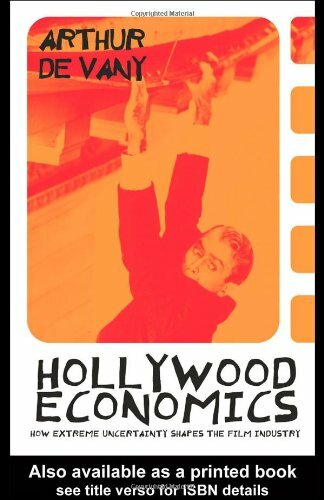 Hollywood Economics: How Extreme Uncertainty Shapes the Film Industry by economist and — not making this up — evolutionary fitness guru Arthur De Vany is not, as you might expect, a textbook nor a treatise like The Black Swan. Instead, it is a collection of scholarly papers by De Vany and other collaborators over the course of 20 years, dealing with all aspects of the Hollywood business cycle. The papers wade into some pretty deep waters. Example title: “Bose-Einstein dynamics and adaptive contraction in the motion picture industry”. Thankfully for me, writing this review with limited close-reading of the texts, De Vany summarizes the conclusions he draws from the data in plain language. The paper on the effect of stars on box office was one of the most fascinating parts of the book. Although the analysis was done only up to 1996, it’s still fun to look at charts that show how “stars” like Tom Hanks, Tom Cruise and Steven Spielberg can influence various factors such as box office, length of run and budget — or, as De Vany points out, perhaps these factors are what make stars. Someone who is lucky enough to get cast in a movie that becomes a big hit will get offered better projects, and can have a great career just because of the initial lucky break. Kurtosis refers to the shape of the probability distribution; it is peaked and skewed, with a heavy tail to the far right. A kurtotic distribution has the property that small events are plentiful and of little importance while extraordinary events are rare, but powerful. As far as I can tell, it’s the same idea as Taleb’s The Black Swan and the same math as in Barbabási’s Linked. Which movies will become hits is highly unpredictable. A slight change in one variable can cause massive changes in results. Movies are very individual, so even breaking them down into elements which are comparable — rating, genre, budget, presence of stars — doesn’t an apple an orange make. In this environment full of randomness, the best that one can do is build a portfolio of films which doesn’t limit the upside potential, but does limit the downside. All in all, I seem to have stumbled into a well-planned series of lectures on the secret numbers behind the movie business, culminating in the deep geekery of De Vany’s Hollywood Economics. I should note that all of these writers are considered somewhat outside the conventional wisdom, although their theories seem to have moved a lot closer to it from where they were just a few years ago. Keeping that in mind, these books are a course plan I heartily recommend to anyone who wants to pull back the curtain and see the wizard of Hollywood’s Oz, as well as get a glimpse of the patterns behind many other forces in the world. Racism or Just Good Business?